Cantharellus formosus - the Pacific golden chanterelle: photo © Kuo, M. (2006, February), retrieved from MushroomExpert.com (all rights reserved; used by permission). The Pacific golden chanterelle is recognized as a separate species from the golden chanterelle mushroom. It forms a mycorrhizal (symbiotic) association with conifer forests of the Pacific Northwest - specifically western hemlock, Douglas-fir and Sitka spruce (and live oaks in California). 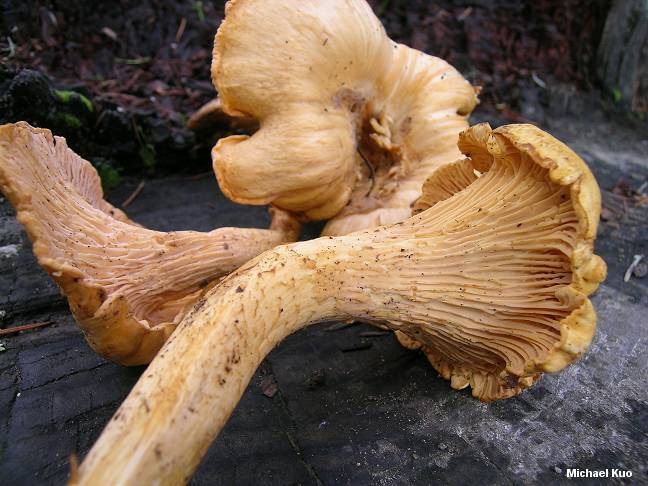 The Pacific golden chanterelle's physical appearance is distinguished from other chanterelle mushrooms by a long, graceful stem tapering to the base, tiny dark scales on the cap surface, pinkish orange-yellow cap colors, and a pinkish hue in the false gills. However, the scales and pinkish colors are sometimes absent in wet conditions (frequent in Oregon).